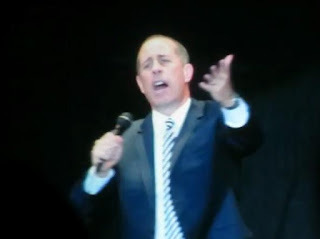 Comedian Jerry Seinfeld brought his stand-up routine to Israel for the first time, as part of his world tour. Last weekend he performed four shows in Tel Aviv. The 61-year-old multi-millionaire entertainer, whose nine-season sitcom became a cultural touchstone unmatched in TV history, went back to his roots on Saturday night in Tel Aviv and proved that he was master of his domain – the field of stand-up comedy. Dressed in a stylish suit that showed off only a little more bulk than in his TV heyday, Seinfeld soldiered on through some hoarseness with a slick, well-rehearsed set that had the appreciative audience frequently breaking into applause. An hilarious opening focused on the audience’s decision to attend the show and all the details it entailed, offered in Seinfeld’s trademark earnest outrage, which is more staccato and manic that the TV monologues of old. He localized his bits a few times, mentioning the vast array at Israeli hotel breakfasts and how it brings out the worst elements in people. Here's a video clip from his performance in which he talked about our dependence on cell phones and the wide technology gap between email and the U.S. Postal Service.